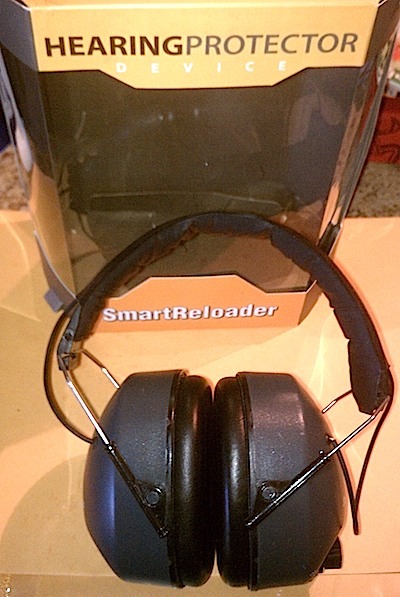 I first saw the SmartReloader Electronic Earmuffs at one of the Mesquite shows, then again at Conroe. In both cases, they were heavily promoted by the vendor as a near-magical device that was available for the ‘show special’ of $40. I was a bit skeptical, but I tried on a pair at Conroe and the product seemed adequate, albeit far below the quality of other electronic hearing protection I’ve used in the past. Now, the whole ‘show special’ thing generally makes me suspicious. I’ve seen ‘show specials’ that range from really good deals to rip offs masquerading as a good deal. So, always take your smart phone to a show and do a quick Google search before reaching for your wallet. First, let’s see what SmartReloader sells their own product for at their online store – at the time of this post and for a couple weeks prior (when I first hit the link), it appears as if the MSRP is $34.95 and they are on sale for $24.95. A quick look at Amazon shows them available (from Viking Armory) for the low 20’s (at the time of this post). So, I ordered a a pair for review. Now, the question is whether or not the product is worth your shipping time and money for the low twenties. At that price level, I would say no to barely worth it. Let’s take a look at the product. The earmuffs can be ordered in black or OD/G and are packaged in a nice-looking case, but the appearance hides a clearly low-quality product. The construction is obviously low-end, which you can tell from the moment you install the batteries, a process that is a little cumbersome with the recommended coin (just found a use for my new GunTool). The fit is adequate, but comfort is no better than the $11 Pyramex earmuffs I purchased at Eagle Gun Range, although they do fit a bit looser than the Pyramex. The SmartReloader 875’s are quite large and take up a noticeable amount of space in the range bag. Speaking of the range, the first test I performed was to see how good the SR 875’s perform purely as earmuffs, without any benefit of the electronics. This is important because if the electronics fail for any reason (and it’s a mechanical device, so that risk is always present), then all you have to protect your ears is what’s housing those electronics. My instructor, Scott Caylor, let me try out his electronic earmuffs with them turned off to illustrate this very point. So, I turned on the TV with the SR875’s having no battery installed. I could hear almost as good as with the earmuffs off. Next, I installed the batteries, turned the volume down low, and tested the amplification. Adequate, but just adequate. Nothing special or ‘magical’ as implied by the vendors. Pretty much a low-end product in line with a low-end price. Just to re-affirm my suspicions, I stepped into the staging area between the range lobby and the first bay with the SR 875’s turned off. It only took two shots for me to want to turn them on very quickly. Once on, they do a good job of reducing sounds over 85dB, although the noise reduction does not appear to be any better than the even cheaper Pyramex muffs. It’s very important to realize that you are relying almost 100% on the electronics for hearing protection. If you insist on ordering the SR 875’s even for temporary use (say an outdoor lesson), then please wear some foam plugs. I would recommend NEVER using these earmuffs without backup hearing protection in an indoor range. Cheap products are cheap for a reason and hearing is just too important to skimp. If you’re looking for an inexpensive backup set of ear muffs for an outdoor lesson, then these might be an option. If you want to get into electronic hearing protection in a serious manner, then please invest in a serious product. And, if you’re ever at a gun show and someone offers SR 875’s to you for a ‘show special’ of $40, please spend your money elsewhere.